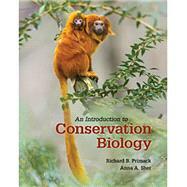 New coauthor Anna Sher joins longtime author Richard Primack in creating a book that combines the readability of Primack's A Primer of Conservation Biology with the depth and coverage of his larger textbook, Essentials of Conservation Biology. The result is a book well suited for a wide range of undergraduate courses, as both a primary text for conservation biology courses and a supplement for ecological and environmental science courses. Using the chapter framework of the current Primer as a springboard, the authors have added three chapters focused on population biology conservation tools (Chapter 7), restoration ecology (Chapter 10), and the future of conservation (Chapter 12). Sustainable development, ex situ conservation, and other key topics have been expanded and updated with hundreds of new examples, explanations, citations, and figures to enhance learning and excitement for the subject. Mining her experience teaching conservation biology with Dr. Primack's texts for over a decade, Dr. Sher fine-tunes the presentation of difficult concepts, particularly in economics and politics. Coverage of recent conservation biology events in the news--such as the poaching of Cecil the lion, the first papal encyclical on the environment, and the international Paris Accord on climate change--keeps the content fresh and current. The book's twelve chapters (see Contents) focus successively on biological diversity and its value; threats to biological diversity; conservation at the population and species levels; protecting, managing and restoring ecosystems; and sustainable development. Each chapter begins with general ideas and principles, beautifully illustrated in full color with diverse examples from the current literature. Chapters end with summaries, an annotated list of suggested readings, discussion questions, and extensive summary statements in the text margins, as study aids. Throughout, the authors maintain a focus on the active role that scientists, local people, conservation organizations, government, and the general public play in protecting biodiversity, even while providing for human needs. Richard B. Primack is a Professor in the Biology Department at Boston University. He received his B.A. at Harvard University in 1972 and his Ph.D. at Duke University in 1976, and then was a postdoctoral fellow at the University of Canterbury and Harvard University. He has served as a visiting professor at the University of Hong Kong, Tokyo University, and the Northeast Forestry University in China, and has been awarded Bullard and Putnam Fellowships from Harvard University, a Guggenheim Fellowship, and Humboldt Fellowship from the German government. Dr. Primack was President of the Association for Tropical Biology and Conservation, and is currently Editor-in-Chief of the journal Biological Conservation. Thirty-four foreign-language editions of his conservation biology textbooks (the Essentials and the shorter Primer of Conservation Biology) have been produced, with local coauthors. He is an author of rain forest books, most recently Tropical Rain Forests: An Ecological and Biogeographical Comparison (with Richard Corlett). Dr. Primack' s research interests include: climate change biology; the loss of species in protected areas; tropical ecology; and conservation education. He has recently completed a popular book about the impacts of climate change, titled Walden Warming: Climate Change Comes to Thoreau's Woods. Anna Sher is a Professor of Biology at the University of Denver, where she has taught Conservation Biology since 2003. She held a joint position as the Director of Research at Denver Botanic Gardens from 2003-2010. Dr. Sher has published books and articles for academic, trade, and popular audiences on various topics within conservation biology, including restoration ecology, rare plant conservation, and climate change. She is one of the foremost experts on the ecology of invasive Tamarix trees and was the lead editor of the book Tamarix: A Case Study of Ecological Change in the American West (Oxford University Press, 2013). Dr. Sher received her Ph.D. in Biology at the University of New Mexico in 1998, and was a postdoctoral fellow at the University of California, Davis and as a Fulbright Scholar in Israel. She has also led scientific study-abroad programs in East Africa, and is a contributing science writer for the Huffington Post blog. Chapter 2. What Is Biodiversity? How many species exist worldwide? Where is the world's biodiversity found? Prioritization: What Should Be Protected? Can Technology Bring Back Extinct Species? How effective is conservation funding?